Finally it all makes sense. The chaos of diverse viewpoints coalescing in what looks like a manufactured finale, but is actually just the opposite. The resonance of the drama that we call life is to be heard throughout this charming brew of light and dark. While on the surface the narrative remains splendidly sunny, with the Punjabi town of Mogra coming alive to the sounds of R.D. Burman's immortal tune "Ek ladki ko dekha" and you know the rest... under the hustle and bustle of provincial preoccupations, under the bubble and banter (with Juhi Chawla overdoing her 'Dolly Bindra' act) the film secretes a somber truth about gender biases and sexual preferences. Normal is what we crave to be. But what, pray tell, is 'normal'? For the film's quiet and lovely protagonist Sweety normal is to love another person of her own gender. But how can she share this secret with her well-adjusted warm and hospitable father Balbir, played with motivational genuineness by Anil Kapoor. Needless to say, the father-daughter sequences ring a hundred and ten per cent true. How could they not when the two players are not playing? Debutante director Shelly Chopra Dhar effectively conveys the mutual love between Kapoor and Ahuja and yet when we realize how little Kapoor's Balbinder knows his daughter we never hold that against him. I mean, have you seen Anil Kapoor's smile? Sonam plays the sexually disoriented small town girl with the effective blend of bewilderment and resignation. She never gives way to exhibitionist grief. I wish the script gave her more space to mourn, to celebrate her solitude. Rather, Sweety, that's our sexually ambivalent heroine, is constantly crowded with attention. It's almost like the Gods have somehow conspired to make sure she never wallows in her dark secret. It all comes apart by mid-point and then together again when a play is staged by the affable Sahil Mirza (Rajkummar Rao, investing that extra something into his character to make it special) where Sweety's secret gets a public platform. Rao's Sahil is a catalyst we all needed in our lives when we are stuck for a solution. He is a very charming Mr Fix-it who won't let his father's affluence corrupt him. Anil Kapoor's "acceptance" speech had me in tears. When his character opens its arms to his daughter's homosexuality he also acknowledges his own suffocation at not being able to do what he liked best in life. Cook. The film cooks up a small storm in a large tea cup. To put the theme of social acceptance of homosexuality on a small town stage is a stroke of genius. All the societal and gender prejudices are addressed in a light effervescent manner where nobody gets offended, at least not in the audience down here from where I was watching the tender tale unfold in a silken rustle of a beautifully threaded quilt being pushed aside as the early-morning sun beams into the room through the slit in the curtains. "Ek Ladki Ko Dekha Toh Aisa Laga" is a timely post-377 wake-up call for mainstream Indian cinema to look beyond the stereotypical relationships into the abyss where many sorts of unexplored relationships languish. This is not a "mind-shattering" experience (a term Juhi Chawal's loud over-the-top Punjabi character loves to throw around). But it it's heartwarming story filled with a music sunshine and compassion. 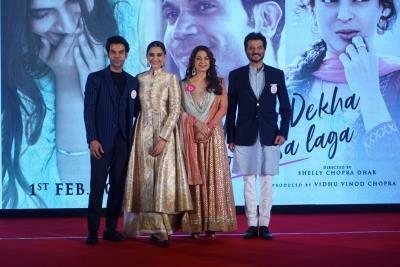 Anil Kapoor, Rajkummar Rao and Sonam K. Ahuja are splendidly joined at the hip by a script that bleeds empathy but never pleads for sympathy.